So after riding the Bayou 300 4×4 a few times, a problem with the centrifugal clutch began to be evident. These clutches are very expensive to replace, and often when buying a used one online, you receive one that is just as worn out as the one you are trying to replace. So…I’ve come up with a solution (I’m sure other people were doing it long before I discovered it) for extending the life of a worn centrifugal clutch. First, there are a few things you need to know. There are two clutches: the main clutch, also called a primary clutch, which engages the engine to the transmission, and the centrifugal clutch, also called a secondary clutch, which operates the main clutch by engaging it when the engine reaches a certain RPM. This is how the engine can idle while in gear and operate at low RPMs without stalling. The centrifugal clutch is mounted to the engine crankshaft and uses a series of spring-loaded shoes. When engine RPM reaches a certain point, centrifugal force overpowers the springs, the shoes move outward, and they contact and lock to a drum which is geared to the main clutch. When the centrifugal clutch shoes are worn, the clutch generally slips at low RPM at the point of contact with the drum. The main clutch is mounted to the transmission input shaft and uses a series of spring-loaded friction discs and steel plates. When the springs are engaged, the plates lock together and allow the transfer of power from the crankshaft of the engine to the input shaft of the transmission. 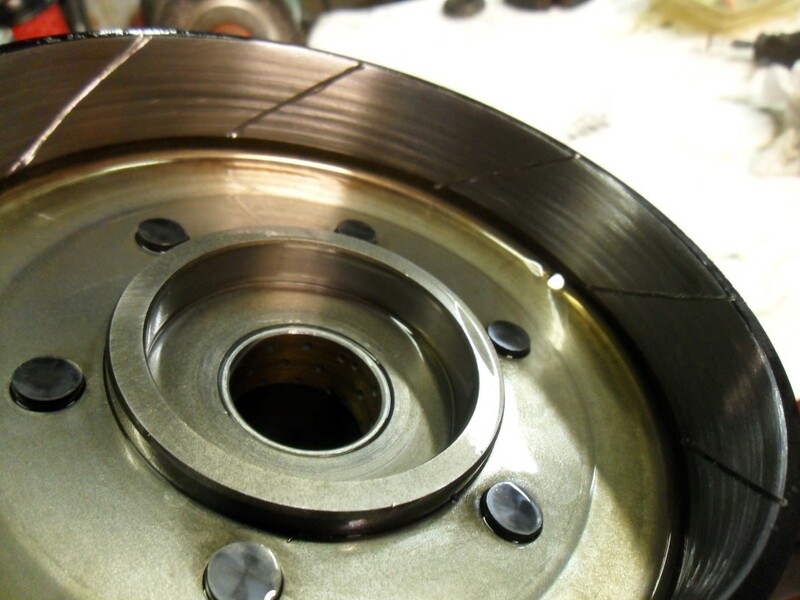 When the components become worn the clutch will slip, usually in high gear or under heavy acceleration. Both clutches are “wet clutches” meaning that they run in engine oil. The oil keeps them cool and helps them last longer. The friction materials in these clutches displace the oil when engaged and allow the clutches to “grab” and work properly. When worn, the parts do not displace enough oil and they slip. Specifically concerning the centrifugal clutch, there are grooves cut into the shoe linings so that oil can dissipate when the shoes make contact with the smooth surface of the drum. Over time, grooves begin to form in the smooth drum surface and the grooves in the shoe lining become shallow as the lining material wears; both conditions lead to less oil displacement which causes slippage. With the symptoms my ATV has, I’m pretty sure my problem is the centrifugal clutch…well, that and the fact that Bayou 300’s are well known for eating centrifugal clutches. So the work begins. 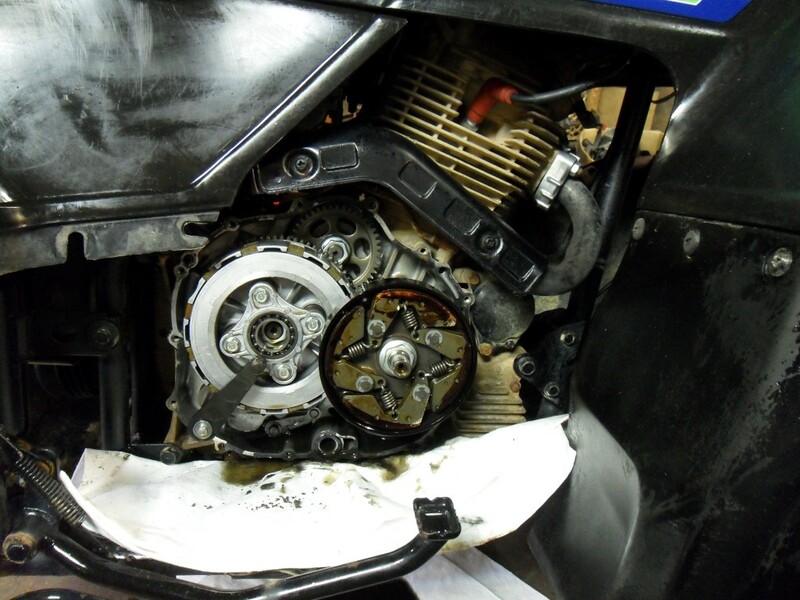 I start by removing the right heel guard and foot peg so I can remove the clutch case cover as seen below. In the photo above, the main clutch is the one on the left and the centrifugal clutch is the one on the right. 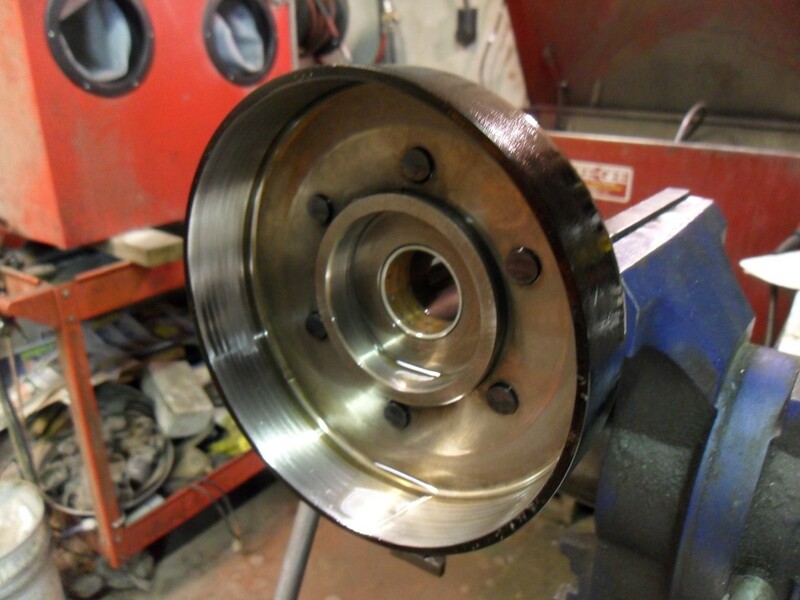 To remove the centrifugal clutch, remove the center nut, turn both clutch assemblies until the indentation on the main clutch basket lines up so that the drive gear on the back of the centrifugal clutch drum will clear, and it should slide off. If it doesn’t slide off easily, sometimes a little persuasion from a rubber mallet helps. Once removed, I start with the shoes. I use a Dremel tool with a small, high speed cutting wheel and I simply trace the original grooves in the shoe linings. I do not recommend cutting all the way to metal. The idea is to make what is left of the existing grooves a little deeper, giving the oil a good path of escape. If you do not have a Dremel, this can also be done with a small hack saw blade. Next, I address the drum. Place the clutch drum in a fixture such as a vise and inspect the contact surface. If the drum is worn, there are usually groves in this surface. 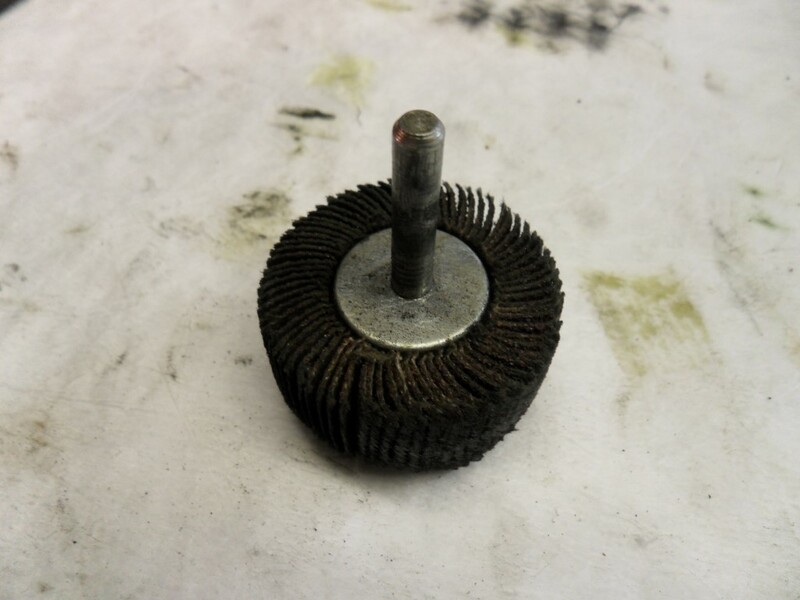 To correct this, I use a high speed abrasive wheel like the one shown below…in fact, I actually used this exact one. These can be found at a welding supply store and work great in an electric drill or pneumatic tool. 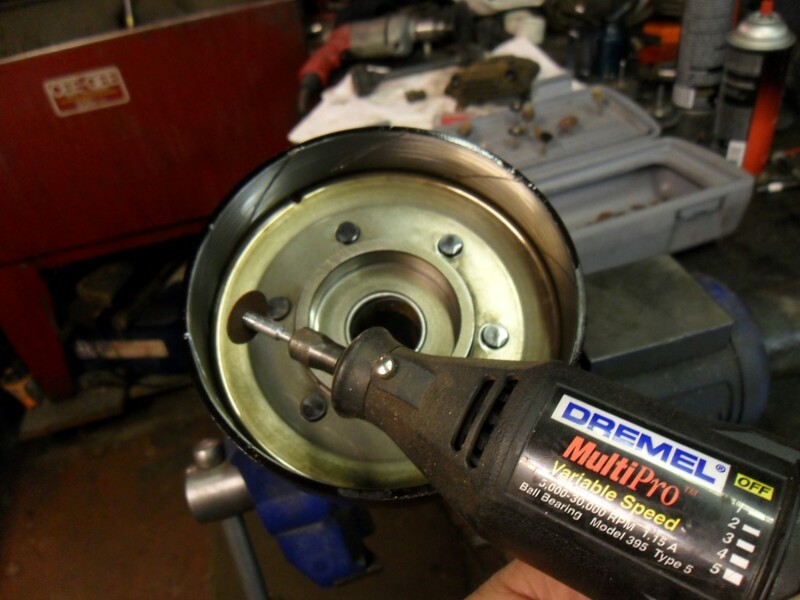 With the drum in the vise, I chuck the abrasive wheel in a drill and go to work smoothing out the grooves. Sorry, I don’t have a “before and after” shot, but I do have the pic below which shows the drum after. You can still see where the grooves were, but they are much less deep. I didn’t take it any further because I didn’t want to risk going too far and rendering the drum useless. The final step is one that most people either don’t know about or don’t do for some reason, but it’s actually the most effective. Once the drum surface is smooth, I use the Dremel tool with the same cutting wheel mentioned above, and I cut diagonal grooves in the drum surface. Determine the direction of travel when the clutch is in use and cut the grooves from the inside of the surface diagonally toward the outside. Don’t cut all the way through, just cut them about as deep as the grooves in the shoes. As the shoes engage the drum, these diagonal grooves give the oil an easy exit path. Some people may be leery of cutting their drum, but what’s the alternative? Buy a new one? If the clutch is already junk, what have you got to loose? Whatever the case, it works great. So at this point you are ready to reassembled the ATV in the same manor it came apart. Once I had it back together, I took it out for a good test drive. The clutch has never worked so good…at least since I’ve owned it. Nicholas, I have a 1995 Bayou Klf300-c7. I am having a hard time finding neutral and the clutch slips at high rpms. This is an awesome write up. One question though, how do you get the center bolt off the centrifugal clutch? The flywheel spins. I have tried every which way to hold it still. Any recommendations? The easiest way to remove the nut is with an impact wrench…with that, you don’t have to hold anything, it will buzz it right off. If you don’t have an impact, you can place a penny between the gears to hold everything still. It will mangle the penny but won’t hurt the gears. Brilliant write up thanks Nicholas – your clever mod got me out of a real hole. The centrifugal clutch on our Eiger started slipping, I think towing a small set of harrows pushed it over the edge (has done about 23.000 km.) The clutch cover got so hot that it softened and distorted the black plastic guard near the foot brake lever. 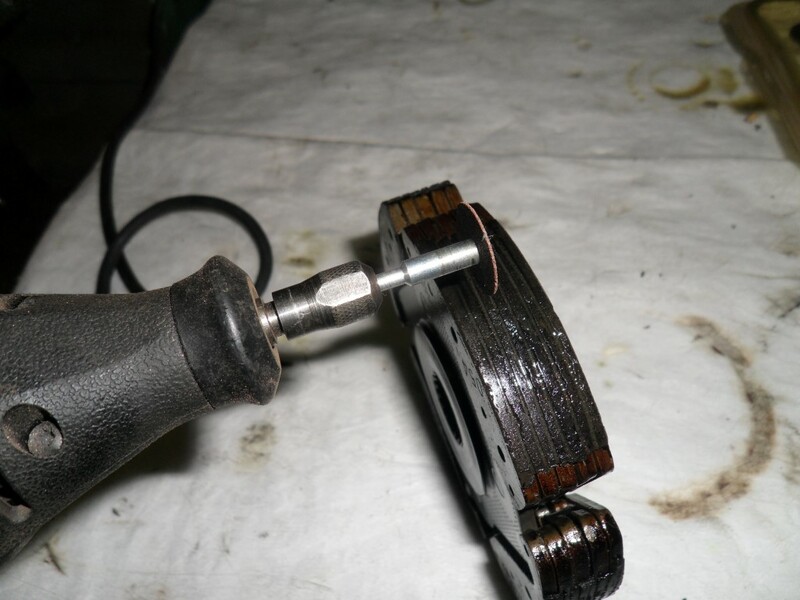 When I pulled the clutch cover off I found the the drum that oil had carbonised on the outside of the drum, I grooved the shoes as you described with a dremel fibre wheel and it has worked really well. To get all the grooves straight and at consistent spacing I put the dremel wheel/spindle in a small drill press and adjusted the table to the right height for each set of grooves, sliding the shoes over the table against the wheel. Didn’t have time to pull the clutch drum out and reface it or cut the grooves. Will keep that in mind for next time. Thanks a million. Thanks for the message. Glad some of my rambling posts have been useful to someone. This is such important and needed info. Thanks! My mouse was hovering over the “buy” button on ebay for a new cent. clutch. Many many thanks. I’m doing this tonight for sure. I’d start by ruling out a fuel delivery issue. Sounds more like it’s running out of fuel from a clogged filter or vent line.